On our way to Gulu this morning, we stopped by the Ziwa Rhino Sanctuary. Ugandan rhinos were hunted to the point of extinction in the early 1980s, as apparently, their horns are more valuable than the elephant’s tusks, which I did not know. 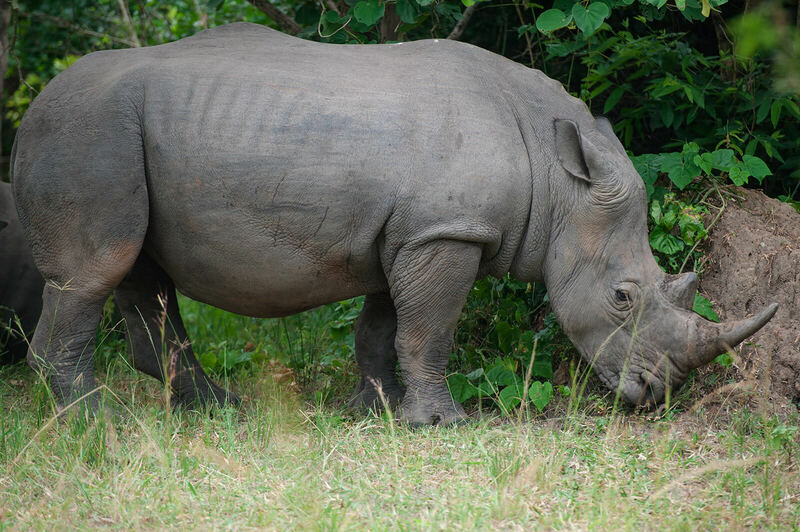 This rhino sanctuary was started in 1997, in an effort to bring rhinos back to Uganda. They have been given some white rhinos from the United States and Kenya, and they have been successful in breeding some new little ones- the newest one was born June 1! This rhino sanctuary was kind of awesome- you head into the park, pay your fee and pick up your tour guide who rides with you in your vehicle. Because there is still a potential temptation for poachers to kill the animals, there are rangers who follow the rhinos at all times, which also makes finding them in their 70 square km home a little easier. We picked up our guide, and began the long drive to the other end of the reserve. Your vehicle can only get you so far, though, and at that point you get OUT of the vehicle, and walk in the rest of the way. I knew this before going (I’m one of those crazy researchers- Trip Advisor was my best pal on this one), but when the time actually came to get out and walk into the jungle, I must say I was a bit nervous! We walked maybe 5 to 10 minutes into the trees, and there found four white rhinos (or mzungu rhinos, as our guide kept calling them) laying down under some trees. They are HUGE animals, who can get up to 3 tons in weight, and can run up to 45 km/hour when they decide it is necessary to do so. We were 20, to at the most 25 feet away from these huge animals, with nothing between us but some grass. Our ranger told us that if it was necessary to make a quick escape if they got uncomfortable, that our best plan was to find a tree and climb, as what human can outrun an animal who run at 45 km/hour easily? At one point, Obama (named after the US President, as his mother was from the States, and his father from Kenya) stood up, and moved toward us, staring very intently as he came. I very quickly found my tree of choice, but thankfully didn’t need it! He just stood nicely for a few photos, before laying down again. PHEW! The very important person we met today, was the child my family and I sponsor through Watoto. I was SO excited to have the opportunity to meet him in person, give him a few small gifts, and be able to tell him that he has another family in Canada who love and care for him deeply. My son will be very excited to see the pictures of our sponsor child and I together, as he was wearing a Spiderman shirt, which I know he will definitely approve of! We had bought our sponsor child a soccer ball before I left, and my son wanted to also send a soccer jersey that had previously been his, which was pretty cool for him to want to share that. It was an incredible blessing to me to hug him and tell him we love him. He watched a short video on my phone that my husband and children had made before I left, and everyone swarmed around to watch, with big smiles on their faces. Though I could not speak a lot with him, as he doesn’t speak much English, I know that the love speaks across all languages. I am excited to send him the pictures of us together, and to plan to visit him on our next trip to Uganda! If you don’t yet have a sponsor child, I would encourage and challenge you to seriously consider it. Being here, we have seen first hand the difference sponsorship makes in the life of a child. Access to schooling, food, shelter, clean water, medical care- what child doesn’t deserve those things that we take so for granted? Whether that sponsorship be through Watoto, World Vision, Compassion- it doesn’t matter. What matters is taking that time to make a difference in a child’s life for today, and for their future.